I've realized since I got my iPhone that I don't use my camera as much for everyday uses... So I decided to upload the best pics from my phone into my blog, genius! This pic is from when I was in Lodi. 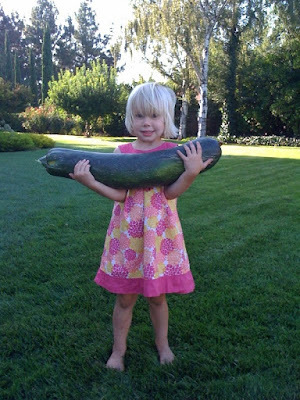 My parents have a garden, but they don't know that you have to pick a zucchini before it grows to be too big. Aubrey is illustrating how massive it truely was! My family had lots of fun playing with the picture editing on my phone during church. 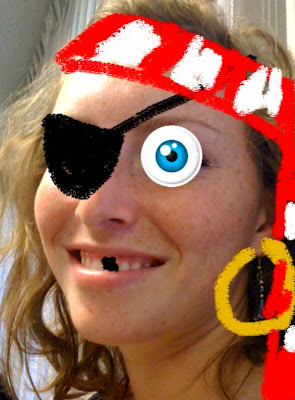 Noelle edited this pic of Shannon and made everyone laugh for like 5 minutes! 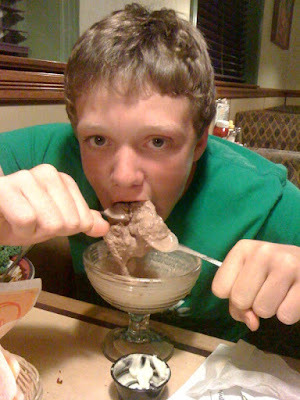 I went to Coco's with my dad, Colin, and Aubrey and Colin had me take this pic for Noelle's benefit. Wished she were there! 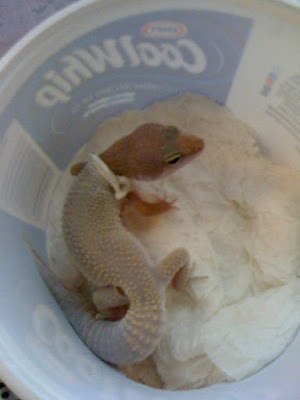 Our pet gecko (Ginny) sheds about every 2 weeks, usually during the night and she eats her skin (EW!) before the morning, so we never get to see it. I came home in the middle of the day one day and saw her like this, so I snapped a quick pic and then let her alone to finish up and eat her snack (EW!) in peace. 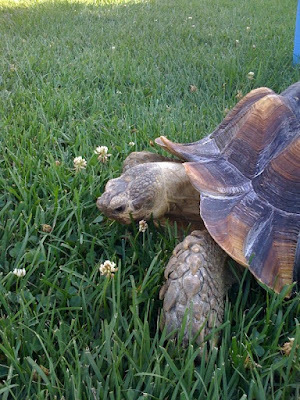 Every once in a while at the museum I have some down time and I like to bring Oatis out onto the grass to roam around. It's usually unsuccessful, as he is so obsessed with eating that he will just chow on the grass the whole time, but we get to know each other... and I get paid for chilling outside, so it's cool. 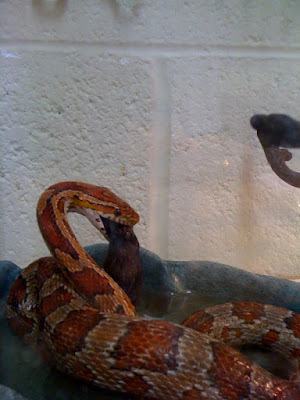 The reptiles at work get fed mice once a week and the best snake to feed is always Elpheba, she thinks the mouse is live so she'll strike at it and squeeze it for a bit before immediately gulping it down. It's cool to watch. 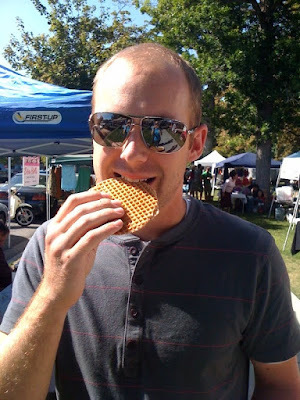 Chase and I went to the farmers market yesterday and he bought some of these Dutch Waffles that he used to eat on his mission with his Dutch companion. They're crispy and filled with caramel, Delicious! 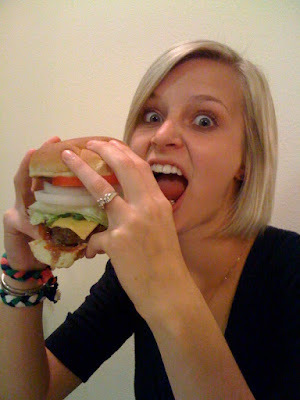 Tonight Ashlee came over for dinner and I made hamburgers. I like everything so much that when I make my hamburger I always think, "Tomatoes? I like tomatoes, I'll add a few extra... Pickles? I like pickles, I'll add a few extra... Avacado? I like avacado, I'll add a few extra..." and before I know it my hamburger is HUGE! Chase and Ashlee laughed a lot when they saw my burger and Chase had to take this pic. 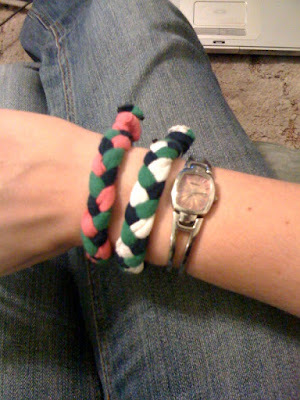 Yesterday I was reading my craft blogs (not to be confused with my cooking blogs...) and I saw a picture of these awesome bracelets made out of old t-shirts, so I pulled some of Chase's out of the DI bag and made these. I love them! I've already made about 10 with the hopes of giving them to my friends. Unfortunately I don't know many people who wouldn't think I was weird in trying to force these bracelets on them... :( Maybe I should sell them for $2 each? I have 6 colors so far: pink, navy, green, white, gray and red. What combos would you like? I have been working on making a scrapbook of Chase's mission and I ran across this sweet little gem. Make sure you watch to the end! Summer has ended and Chase and I are into our Fall semester. During the two weeks between semesters I went to California to "play mom" while my mom and Noelle went to Europe for about 10 days. I took care of Aubrey, Colin and Zaya and helped things run normal while my mom was gone. I was excited to spend time with Aubrey and I had many craft projects planned weeks in advance :) Here are some picks from making rainbow cupcakes with Aubrey. She loved to decorate them and I taught her how to put the right amount of sprinkles on them. Lets just say if Aubrey doesn't want to take a picture with you, it's hard to force her. This was the best smile I could get, and it seems a little sarcastic on her part! While I was in Lodi, Chase went on a pack horse camping trip with our Bishop. Chase's brother, Alex, flew in to go with him. They had fun and I heard a lot of funny stories when we met up in Bakersfield for the second week of our break. We had fun down there and got to see Nicole, Phil and Tori and celebrate Janelle and Phil's birthdays. Chase's mom also gave us tickets to go see Brian Regan in concert as a belated birthday present to Chase. It was awesome. After 2 weeks of vacation school has started up again. I'm taking lots of classes for my major, including a sewing swimsuits class, advanced cooking, and floral design... so you know, pretty tough classes. Haha. Chase is in his last semester of undergrad and taking a few last GEs and holding strong! He complains sometimes, but he still studies hard and gets good grades. I still work at the Bean Museum giving live animal shows. It's a fun job and I LOVE it! The coolest part is that all my co-workers are my age, I've never worked anywhere like that before! Chase is still doing research for a professor on campus which will turn into his graduate research, so that's a win-win! The bottom line is that we don't have much free time, but we want to say congrats to all our friends who have had their babies! Cameron and Mitzi, we need to see Noah immediately! Ryan and Tamie, I'm excited to be an Aunt that spoils her neice! Beth and Mark, I love visiting Spencer and I wish I could come over every day!